Still Passing By (bike messengers) 2000 - Bicivilizados. Ciclismo urbano. Alegría entre tus piernas. These photos were shot between 1998-2000 and became part of a series exhibited at 304gallery, New York in April 2000. The series also exhibited in Barcelona in Sept, 2000. 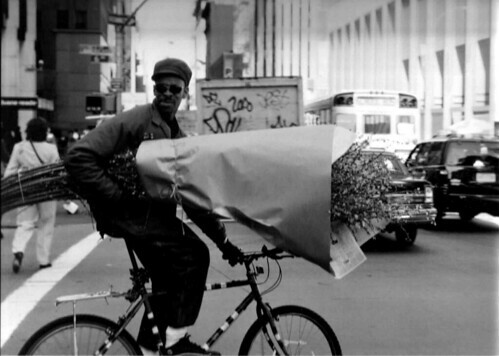 Because a number of these photos ran in the Transportation Alternatives magazine and other NY newspapers, they became part of a campaign to educate the NYPD on the true hazards of cycling in New York and were credited with changing police policy towards bikers. 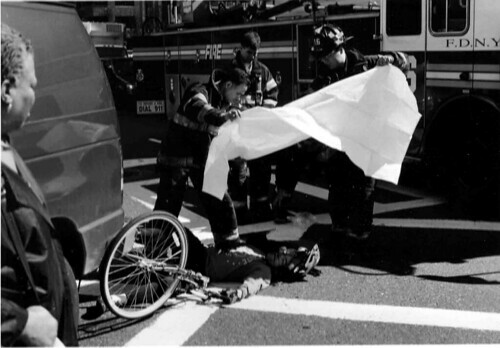 Sadly, 1999 registered the most cycling fatalities in NY history, 40. The series is dedicated to Gustavo, the biker killed at 2nd Ave and 63rd St. in October 1999. No me gusta la foto del chaval muerto. Poca consideración. Sabemos lo que nos jugamos, tampoco es para recordarnos que nos puede pasar la rueda de un bus por encima de la cabeza.